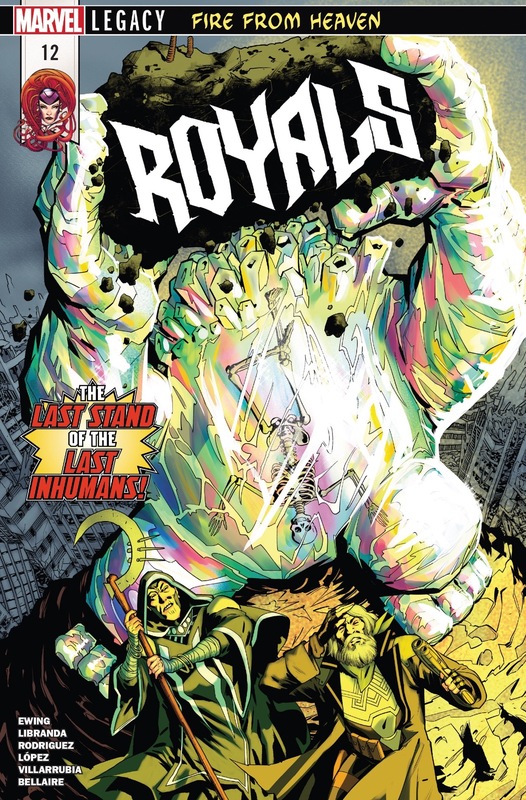 This wild cosmic odyssey comes hurdling toward to its climactic conclusion in this 12th and final issue of The Royals. From the creative team of Al Ewing, Alvaro Lopez, Javier Rodríguez, Kevin Libranda, Jordie Bellaire and Jose Villarrubia. The Royals have escaped The World Farm, the bizarre realm of the mysterious Progenitors… yet the escape has come at a great cost. Gorgon sacrificed himself to allow the others to flee and, though they now rocket away from The World Far, The Royals are still far, far from home with little in the way hope that they might survive the journey. 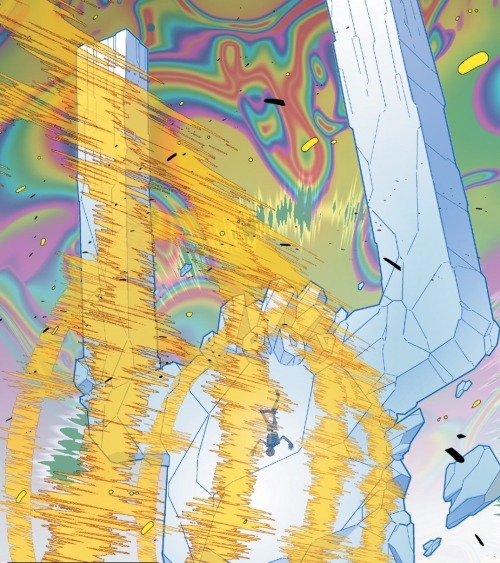 His powers greatly enhance by way of exposure to The Primagen, Flint has been able to construct a crystalline ersatz spacecraft to carry him and the others through the stars. These enhanced powers notwithstanding, the ship Flint has created can only travel so fast for so long. Crystal’s elemental powers are able to provide a breathable atmosphere within the ship, yet it will only be a matter of time before she will run out the base ingredients needed to create oxygen. The only thing that can save the team is Noh-Varr’s pocket battlefield, the advanced Kree technology that can bend and alter the laws of physics. Unfortunately, Noh has been badly injured in the battle and remains comatose. 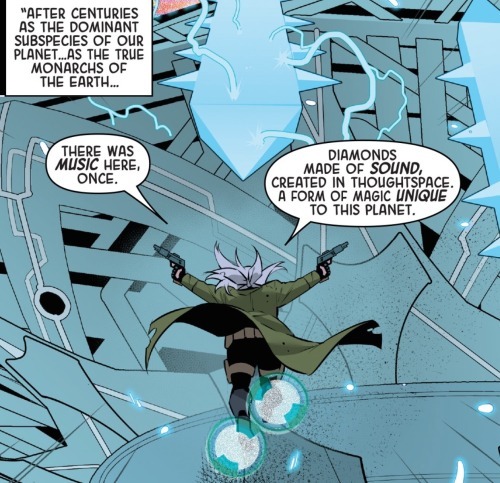 Maximus is smart, but not yet smart enough to navigate the intricacies of Noh-Varr’s tech… and yet, perhaps he might become smart enough to do so were he to expose himself to The Pimagen. 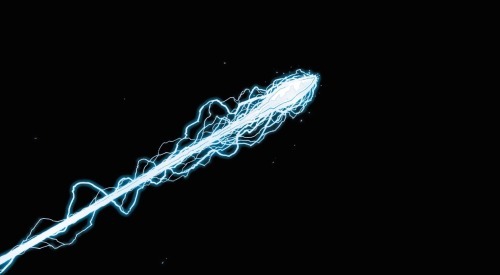 Primagen acts to incredibly augment the powers of any Inhuman who touches it. Maximus’ Inhuman power is his advanced intellect (a power that also may have driven him quite mad). 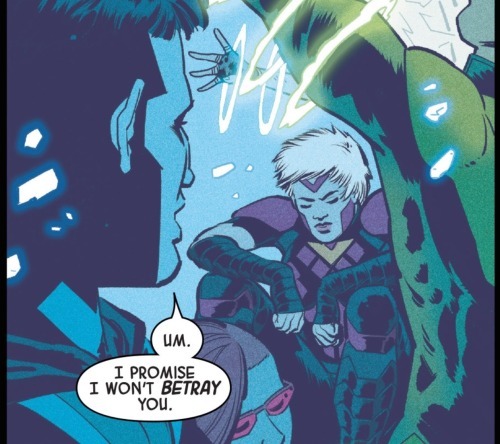 Exposure to the Primagen should in theory enhance this intellect exponentially, allowing him the cognitive skill needed to work Noh-Varr’s tech and devise a means of rescuing his fellow Inhumans. But Crystal objects. Maximus’s powers might be elevated, but who is to say that his madness may not be similarly increased? Medusa, slumped over in grief over Gorgon’s death and still reeling from the mysterious illness that has been slowly killing her, tells her sister to stand down. They have little left to lose so why not allow Maximus this extreme gambit. Taken a bit back by Medusa’s contrition, Maximus utters a meager promise that he won’t betray them. Using his synthetic hands, Maximus takes one of the smaller shards of pure Primagen, pinching it so that various flakes of it sprinkle down onto his face. This is the prima materia, the quintessence that his parents so believed was the key to the true actualization of the Inhuman peoples. Finally, Maximus has obtained what he has seen as his birthright, his raison d’etre… he asks that it teach him everything. …And that is what it does. Within in instant, Maximus’ mind is flooded with a spectral cascade of memories and visions, his entire history from pre-birth to some five thousand years in the future flashes before his mind’s eye. And he is not alone in this dizzying experience. His older self is there, welcoming Maximus; he has been expecting him. Some five centuries in age, he is no longer Maximus the Mad but rather ‘Maximus the Mage,’ the last Inhuman. This older version of Maximus directs his younger self’s attention, focusing it on the last moments of their collected life, to that day in the distant future when The Progenitors finally return to extract their final vengeance on the Earth. The narrative switches, spinning forward to the future setting that has thus far been told in a series of prologues opening each of the previous issues of this series. The earth has been ravaged, its population extinguished and replaced by mutated monsters and alien-looking flora. 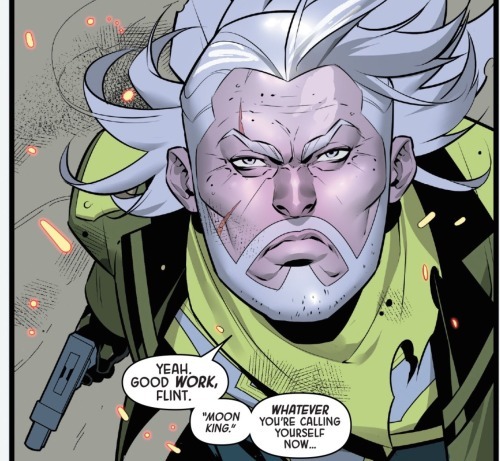 In this future, the aged Maximus and Noh-Varr The Accuser have sought out the Moon King, to awaken him and direct his godlike powers to repel the returned Progenitors. The Progenitor mega-dreadnaught descends from the sky over the ruins of what was once Manhattan. The Progenitor craft is the size of small planet, its circumference flanked by enormous skyspears of pure, crystalline Primagen. This Moon King is a translucent behemoth with a human skeleton at its center. Maximus refers to the king as ‘my liege,’ but Noh-Varr calls him Flint, confirming that transforming into the powerful monstrosity in indeed the future in store for the young Inhuman. The Progenitor craft descends further and a beam of energy emits from its center. The Moon King raises its arms and takes in or deflects this beam. 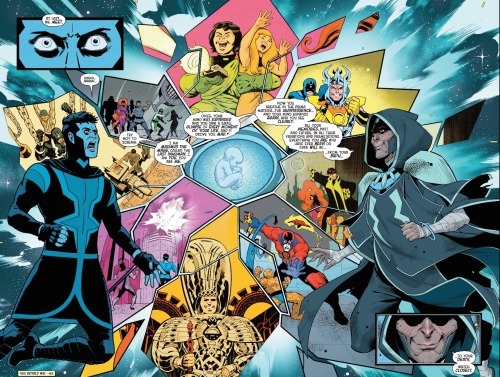 It is uncertain if Maximus and Noh-Varr are confident that their king might defeat these invaders… but they know that their king will need aide. Noh-Varr leaps into action, attacking the ship whist it is distracted with the Moon King. Drawing his twin blasters, Noh laments how the earth had once been a glorious place filled with wondrous music. The Progenitors had taken that all away with their initial attack and Noh is intent on extracting vengeance over this loss. He fires his guns into the superstructure of the craft. All the while, the elder Maximus is narrating the events to his younger self. 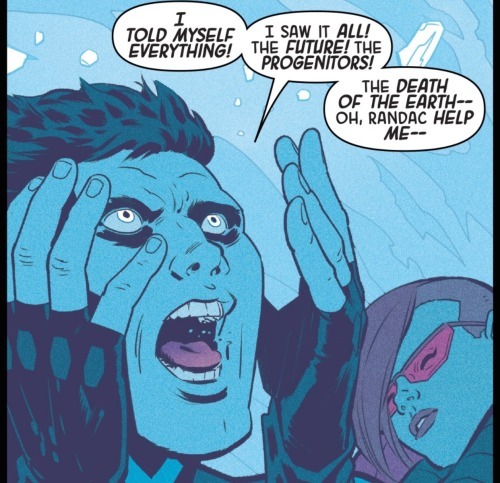 He explains that the Inhumans had lived for centuries as the dominant sub-species on earth, thinking themselves the kings and queens of earth. It was all folly and delusion. The Progenitors arrived to show then how very small the Inhumans truly were in the grand scheme of things. 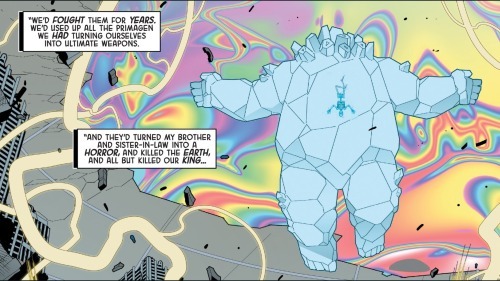 The Primagen, that coveted substance that unlocked The Inhumans higher potential… it was nothing special to The Progenitors. It was merely a power source, a kind of battery that these beings farmed, used and discarded. The Inhuman were and have been nothing to The Progenitors, a simple matter of no real concern. Even when The Royals ventured to The World Farm and broke its main planet in two it was all little more than an inconvenience, an utterly simple matter that only succeeded in piquing their interests. 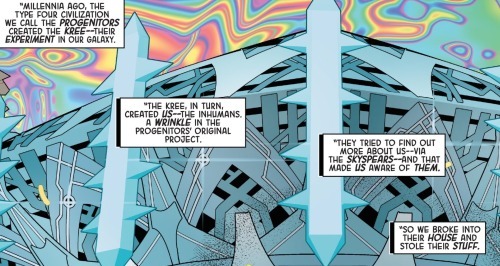 The Kree, the forefathers of the Inhumans, were a genetics experiment conducted by The Progenitors. An experiment that proved a failure when Kree evolution achieved its epoch and would progress no further. And yet the Kree conducted experiments of their own. They created The Inhumans and in so doing managed to succeed where The Progenitors had failed… creating a race that would continue to evolve unabated. And this elicited The Progenitors interest…. a passing interest but an interest nonetheless. The Inhumans possess the quality of potential and that is truly what The Progenitors had attempted to discover. 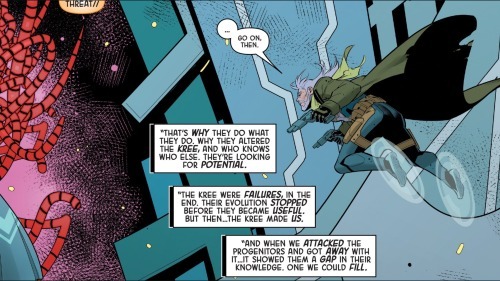 A potential that makes the Inhumans useful, a form of raw material that could be utilized to facilitate their own development, their own progression and evolution. And hence The Progenitors came to earth and ravaged the planet. The various heroes of earth fought them but proved no match. The Progenitors took what they wanted and left behind a ruined earth in its wake. And now they have returned once more… returned one might suspect to test out the various ways in which they have utilized the materials they had obtained. The fruits of this labor is revealed when a Commander-Class Progenitor emerges from the craft. It is a ghastly creature, a biological robot clearly composed of that which was extracted by Maximus’s former family. 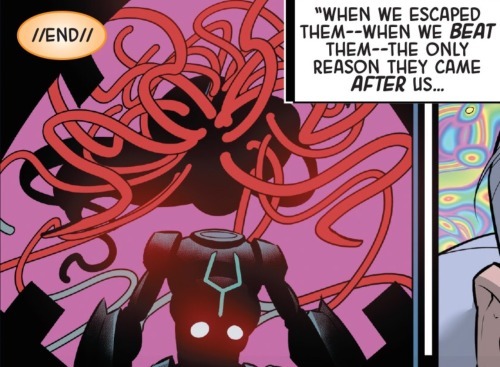 The Progenitor has a head modeled after Medusa, a quaff of robot tentacles mimicking her prehensile hair. 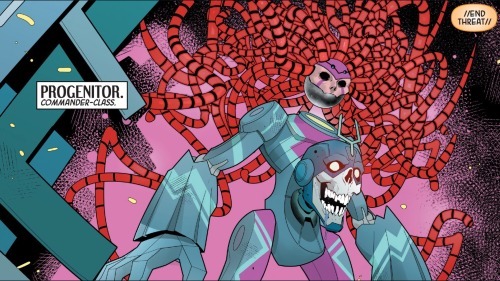 A second head protracts from Progenitor’s chest, a skull-like representation of Black Bolt. Maximus can only comment on the callous irony that at least the royal couple had at last been reunited. The skull opens its mouth releasing a torrent of sonic energy that vaporizes Noh-Varr into ashes. Noh’s death, however, is not in vain – his suicidal gambit was to do some degree of damage to the Progenitor craft, to jostle loose a small fragment of Primagen that Maximus rushes to find amongst the rubble. Maximus knew the Moon King would prove no match to the Progenitors. It was all distraction, a means of obtaining a sample of Primagen that he might use as part of one last ditch effort to make things right. The Commander-Class Progenitor opens up its power to its fullest, disintegrating The Moon King and shattering the entire planet, destroying the final remnants of the earth. Before this happens, however, the elder Maximus takes in that shard of Primagen, exposing himself once more to the purified quintessence. In so doing he is able to commune with his younger self, to reach back through the millennia and speak to himself in the past. Maximus tells his younger self that this is the future in store for them all. The Progenitors will come to earth, they will take what they want and leave ruin in their wake, and they would return once more to test their experimentation and clean up after themselves, destroying the planet. Still, perhaps all is not lost. The earth was destroyed but Maximus had managed to send this warning back in time. He has informed his younger self what is destined to come… imparting this knowledge on his younger self offers the slimmest of chances. Act accordingly and just perhaps a better future might be obtained. Back in the present, Maximus screams as his minds reels to take in and process the overwhelming information imparted unto him by his older self. Near hysterical, Maximus tries to tell the others what he has learned. The Progenitors are coming. They know where they live. They will come to earth, take what they want and bring about its ultimate destruction. The inhumans will fight them, but to fight them is to become them, to offer them up the new weapons that will ultimately be used to facilitate the earth’s execution. The Progenitors are legion, a massive system that annexes what it sees as possessing potential for advancing its own further development and destroying anything that doesn’t. Maximus now knows that The Inhumans are fated to be absorbed and assimilated into the whole. They are gods and there is no way to fight them. Maximus proclaims that he doesn’t know what to do. All this stirs Medusa, waking her from her despair-filled stupor. ‘If they’re coming for us, then we come for them first,’ she says. Added that if they cannot fight then they will cheat. The Progenitors may fancy themselves the creators of The Inhumans, their god… yet defying the will of their creators has been a central tenet of Inhuman society since ints inception. 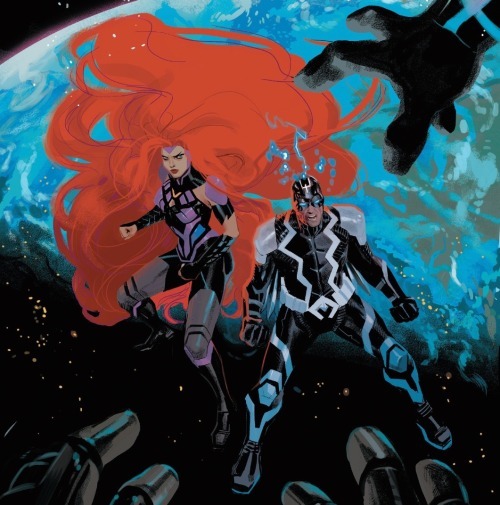 The Kree had claimed themselves the creators and masters of The Inhumans in the past and The Inhumans defeated them and claimed dominion over the entirety of the Kree Empire. Destroying their gods is what The Inhuman peoples do. Medusa states that these Progenitor have made themselves the enemies of the Inhuman People and she will lay her harsh judgement upon them. With this the issue, and the series, comes to a close, setting the stage for the final confrontation to take place in Judgement Day #1.
whoa… I don’t even know where to start. This was psychedelic mind-F#@k of a trip, equal parts fascinating and terrifying. The Inhuman have met their god and that god is an impartial monster of growth and development that seeds its creations simply to be used as stock, raw materials that may or may not have the potential to add to this growth. The Inhumans are little more than cattle, the earth simply a stockyard where they wait to be consumed and their bones and gristle cast aside like so much detritus. The creative team do a wonderful job of mixing the mind-bending narrative with a kaleidoscope of equally mind-bending visuals. Lopez, Rodríguez, Libranda, Bellaire and Villarrubia combine forces to provide a dizzying light-show that had me feelings excited, anxious, intrigued and frightened all at once. 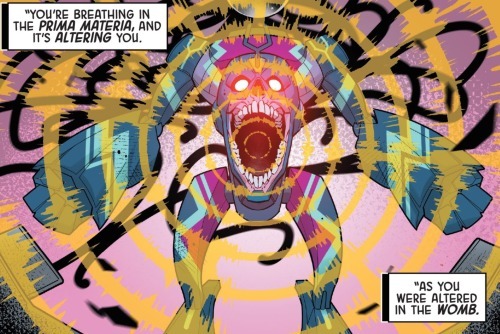 From the abject horror of that amalgam creature composed of equal parts Medusa and Black Bolt, to the cool pastel swirl of aura emanating throughout the atmosphere. There were a whole lot of cooks working on this visual stew, but they managed it in a wonderful concert, producing a wild, haunting and utterly memorable comic. I’m so going to miss this series. I’m hopeful that Judgement Day will provide a satisfactory conclusion, but that does little to offer a balm to the sense of loss that such a neat, unique and original series has come to what I see as a premature end. Marvel’s efforts to ‘make the Inhumans happen,’ to transform them into a popular franchise, was doom from the start. What they are just is not mainstream. They are weird, fringe, outré wildness. They are the B-sides of David Bowie 45s. Those weird and unsettling tracks that disturbed the average listener and never made it onto the radio or those ‘best of’ compilations. I greatly appreciate that Al Ewing and company understood this and fully allowed the Inhumans to let their freak flag fly. Ewing took a bullet in this regard. He produced a true Inhuman book, likely knowing full well that it was destined to fail, that it just wasn’t going to be accepted nor appreciated by the mainstream audience. Of course I realize that I am likely sounding terribly elitist in these comments. It’s not my intention. I just really like the weirdness and understand that there are many who do not. This is fine. Judgement Day will not only conclude the story in The Royals, but will also likely connote the finale of Marvel so-called ‘Inhumans push.’ Looking at The Royals, coupled with Saladin Ahmed and Christian Ward’s Black Bolt, I’m happy that this finale entails The Inhuman being The Inhumans… not ersatz X-Men, not ill-suited superheroes, but rather their true selves. Problematic weirdos thrust into bizarre sci-fi adventures. Four and a half out of Five Lockjaws for the issue; Five out of Five for the series as a whole.